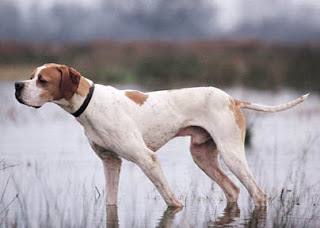 The Pointer is one of most energetic and outdoor loving breed of dogs available in world, it is one of the favorite breed of the owner who want to go outdoor. This breed is very intelligent and loving the are very good in hunting because of their nature, the always remain to be a good hunting breed. The pointer needs early socialization and obedience, because of their aggressive nature they are quite difficult to train. As this breed has a hunting instincts so they are not good with small animals and do not do very well in apartments. This dog breed loves to be with people. they are a very energetic and alert dog breed. they perform best in a field environment and also do good in big homes since they enjoy open spaces. They are not good for the first time owner, the pointer needs an experienced handler and a good trainer.This dog breed generally has one coat which is short and smooth, brushing should be done regularly to avoid dead hair and bathing is given when mandatory they need regular exercise which make them fit and happy. The pointer dog breed is one of the most famous gaming dogs in the world and is a loved hunting companion for many hunters around the globe. A much loved dog breed and an amazing companion the pointer proves to be a very popular dog breed. The average lifespan of the pointer dog breed is 13-14 years of age.